Volleyball Lines on the Court, What Do They Mean? Sidelines, end lines, ten foot lines and substitution lines, what do each of them mean? Volleyball lines, how many are there? 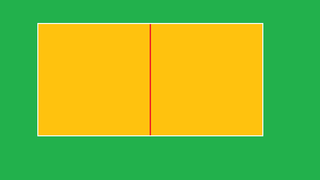 two endlines that're perpendicular to these sidelines that run parallel to each other, while also serving as the two service lines. two sidelines, and divide the two court halves. The ten foot lines run underneath and parallel to the net, between the two poles on a typical indoor volleyball court. There are many lines on the playing surface of a volleyball court. 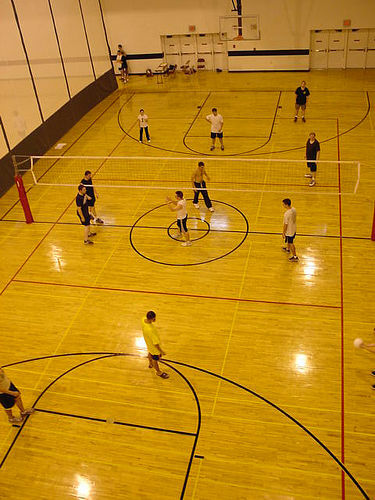 On an indoor volleyball court, the sidelines and the service lines are painted to outline the internal area and the boundaries where the ball should be played. In beach volleyball, there is no three meter or attack line and the sidelines and end line lines are portable synthetic cords that serve as the volleyball court marker to illuminate the court boundaries. The center line separates one volleyball team's court from the other. The centerline measures two inches wide and goes from sideline to sideline which divides the two playing courts into two 29 foot 6 inch halves where the teams play, one on one side and the opposing team on the other. 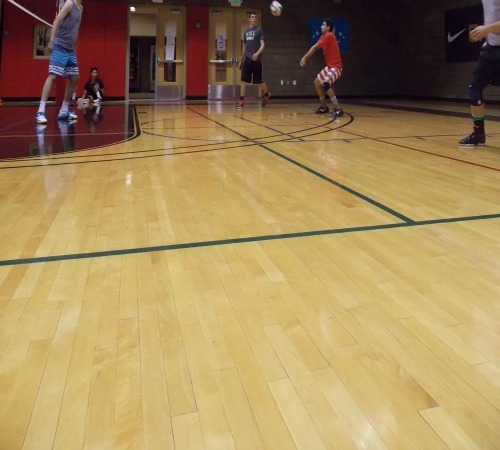 On an indoor volleyball court, it serves as the single fourth boundary line for both sides and is located directly underneath the net. This centerline is a contrasting color so that it's plainly visible to players and referees most importantly as it stretches underneath the net. To separate one team's front row from the other, it is placed an equal distance between the three meter lines of both sides. The line in the left hand side of the frame, the dark blue one is the center line in the photo below. Traditionally, neither blockers nor hitters were permitted to cross the center line with any body parts during the rally, but recently that rule was tweaked so that front row players are permitted to cross the center line as long as they do not interfere with theopposing team's ability to perform or complete an action. There is no visible center line underneath the net, in beach volleyball. Since the volleyball court is shaped like s large rectangle, the sidelines are the longest lines located along the sides of that rectangle. The sidelines, separated by the net, mark the longest boundaries of the court, where both teams remain inside of their designated area of the "rectangle" to play the match. At the beginning of each rally, all six players on both teams must be in their starting rotation located within their team's sidelines. In the front row, once the rally has started, the outside hitters on the team that's on offense can move outside the sidelines to make their spike approach. Where Is The Service Line? 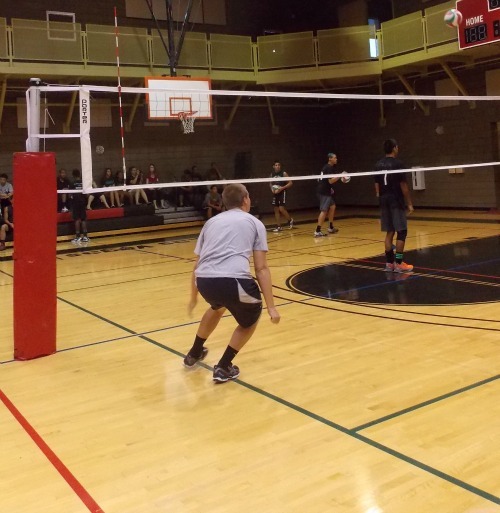 Of all the volleyball lines on the playing surface, the service line is the farthest boundary line from the net. It's parallel to the ten foot and center line and marks the closest spot where a player can stand in order to serve the ball over the net at the beginning of each rally. 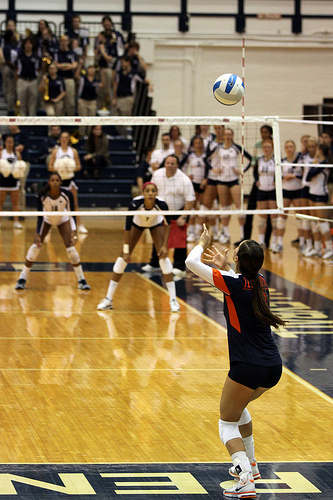 At the beginning of a play, if a volleyball player steps over the service line while serving, she has committed a service error. If a player chooses to jump serve they can't touch the end line or the court before they contact the ball to serve it. Only after they've made contact with the ball can they land on the other side of the service line, in the court. There's an attack line on each side of the court and it's located three meters or approximately ten feet from the net on either side. It exists to separate the front row players from the back row players and it creates a point of reference in the rotation. Front row hitters use the attack line to gauge how far back they need to be in order to begin their spike approach, while back row hitters know that they can only attack a ball that's been set to them, behind this attack line. Where's The Ten Foot Line? The ten foot line, is the same line as the attack line and/or the three meter line. The name of these court lines will change depending on who you play against and in what city, state or country you play the game. Located on both sides, this line is ten feet or three meters from the net, runs parallel to the net, and it separates the front row players from the back row players. If you are a libero who sets the ball to a front row spiker on your team, according to basic volleyball rules for liberos, you must be behind the ten foot line in order for your spiker to be able to take a spike approach and hit the ball above the level of the net. If you are inside this line, the spiker must keep both feet on the ground when they send the ball over the net. Where's The Three Meter Line? As explained previously, the name for court lines parallel to the center line is the three meter line or the ten foot line. Three meters measures out to be ten feet so for those people who usethe metric system they will call this line the three meter line. VolleyBragSwag Volleyball Shirts: Have You Ever Felt Like Saying?